Need printing and mailing services? Perhaps a personalized direct marketing promotion that links to a custom landing page? If you’re looking for more than a cookie cutter print shop or an online-only buying experience with a computerized ‘thank you’, Mitchell Graphics is where you belong. 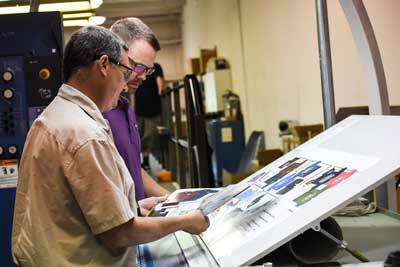 We specialize in digital and traditional offset printing services. We will work with you, as a trusted partner, to help you achieve your end goal. We understand that the best solutions are often a combination of various media including print, digital, and the web. Add in real people offering real solutions – and you are on your way to a well-executed plan based on your individual needs. Spend a few minutes here to learn a bit more about us. Then contact a Mitchell Graphics account manager to learn why 100% of our customers say they would recommend us to a friend or colleague. Leveraging the unsurpassed quality of traditional offset presses, the speed of digital printing, and advanced technologies like variable data printing helps you stay on time and in-budget every time. Rich, high-quality color reproduction, and crisp images all printed and finished using top-quality materials. We can help you at any stage of executing an impactful mail campaign. From ideas and design, list optimization, printing, and delivery. Send an appeal campaign, postcard, or monthly newsletter. We’ll walk you through one of the most cost-effective and productive forms of marketing that yes, reaches millennials too. From concept to completion we’ll help you create new branding or stay brand-consistent with designs that fit your voice and speak to your audience. Form, function, and aesthetics – always. We believe a collaborative approach produces the best designs. We work closely with your team whether you have your own designer or not. Specialized competencies allow us to help you with just-in-time delivery of marketing materials, control of your account and all documents, and multi-channel effectiveness both online and off. Control of printed inventory, proof approval, order history, and more. Ensure all your divisions order consistently branded and updated versions. We’ve assembled a collection of tools and information to help clarify industry terms, provide guidance and templates, and even order free customized samples. Success begins with supported clients. We build custom solutions for every client. See some of our work, and contact us for your customized quotes. From designing and printing to wide-format, merchandising, and beyond, we’re the “more” you’ve been looking for.